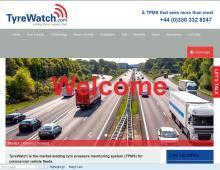 TyreWatch are industry leaders of tyre pressure monitoring for commercial vehicles nationally. Their unique commercial tyre pressure monitoring system is the perfect solution for commercial vehicle fleets looking for a robust, continuous commercial tire pressure monitoring system. The pressure monitoring system for trucks from TyreWatch provides a customer focussed approach that helps you keep track of your fleet, the truck TPMS system is fitted with truck TPMS sensors that will monitor each wheel and inform your driver and fleet manager of any potential issues. The truck tyre pressure monitoring system will help your driver prevent imminent tyre failure and costly vehicle downtime. TyreWatch have considerable industry knowledge of telematics for commercial vehicles including tyre telematics for trucks and tyre telematics for trailers. The TyreWatch system is designed to reduce tyre-related failures through real-time telematics to keep your fleet on the road. The innovative system from TyreWatch is widely used for logistics operations, delivery fleets and coach/bus operators. The trailer tyre pressure monitoring system is fully functional on trailers and other agricultural vehicles including tractors. TyreWatch are a trusted choice for tire pressure monitoring for commercial vehicles and tire telematics for trucks throughout the UK. For more information on their efficient truck & trailer tire pressure monitoring system (TPMS system for trucks) contact a member of the team at TyreWatch.